A crucial success came when Isis-led forces seized the city of Fallujah, 40 miles west of Baghdad, on 3 January 2014 and the Iraqi army failed to win it back. 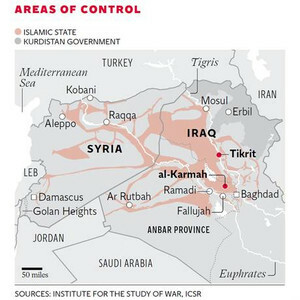 This was the first time that Isis had ruled a large population centre and it is important to understand how it behaved and how and why this behaviour became more extreme as Isis consolidated its authority. The stories of two men, Abbas (generally known as Abu Mohammed) and Omar Abu Ali, who come from the militant Sunni strongholds of Fallujah and the nearby town of al-Karmah, explain graphically what happened during those first crucial months when Isis was in power. A gunman makes a radio call in rebel-held Fallujah, just west of Baghdad in Iraq. A gunman makes a radio call in rebel-held Fallujah, just west of Baghdad in Iraq. Isis told people in Fallujah that it had come to set up an Islamic state, and at first this was not too onerous. A Sharia Board of Authority was established to resolve local problems. Abbas says that “everything was going well until Isis also took Mosul. Then restrictions on our people increased. At the mosques, local imams started to be replaced by people from other Arab states or Afghanistan. During the first six months of Isis rule, the movement had encouraged people to go to the mosque, but after the capture of Mosul it became obligatory and anybody who violated the rule received 40 lashes.” A committee of community leaders protested to Isis and received an interesting reply: “The answer was that, even at the time of the Prophet Mohamed, laws were not strict at the beginning and alcoholic drinks were allowed in the first three years of Islamic rule.” Only after Islamic rule had become strongly entrenched were stricter rules enforced. So it had been in the 7th century and so it would be 1,400 years later in Fallujah.